Discussion in 'General Discussion' started by Perun, Feb 1, 2012. Wonder if @Brigantium has seen this? Anyways should appeal to both medieval history buffs, python fans and general history interested folks. 8 episodes in one season. That description sounds nice! Need to see this. The video you have requested has not been rated and may contain content intended for mature audiences. I can't remember if I watched all of this now. Documentaries have got better, less of the Horrible Histories, people with mud on their faces and eating rats etc. less of the Horrible Histories, people with mud on their faces and eating rats etc. Oh damn, that's the good stuff. When I look at this picture, I think of its context. 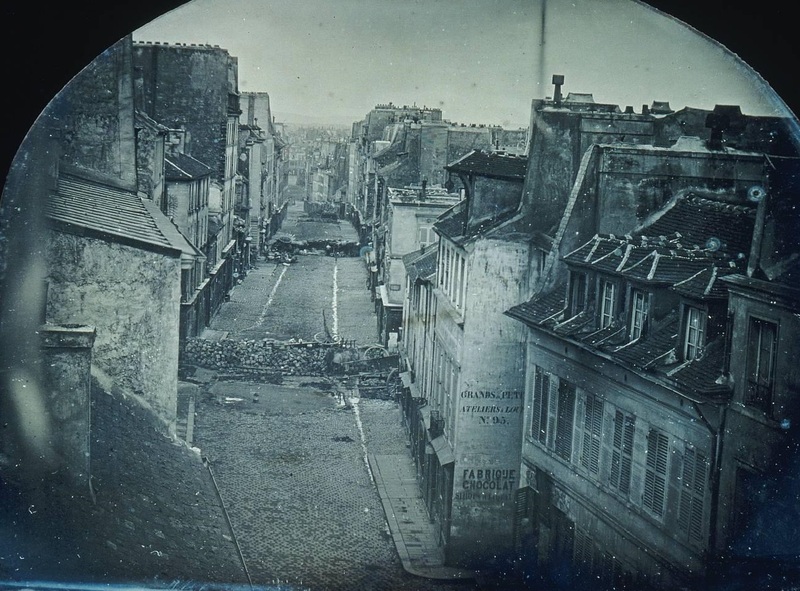 That picture's called Barricades avant l'attaque, Rue Saint-Maur, and was a Daguerreotype taken by a guy named Thibault. It wasn't easy to take a photograph in 1848. The most common way was the Daguerreotype, invented by Louis-Jaques-Mandé Daguerre in 1830. 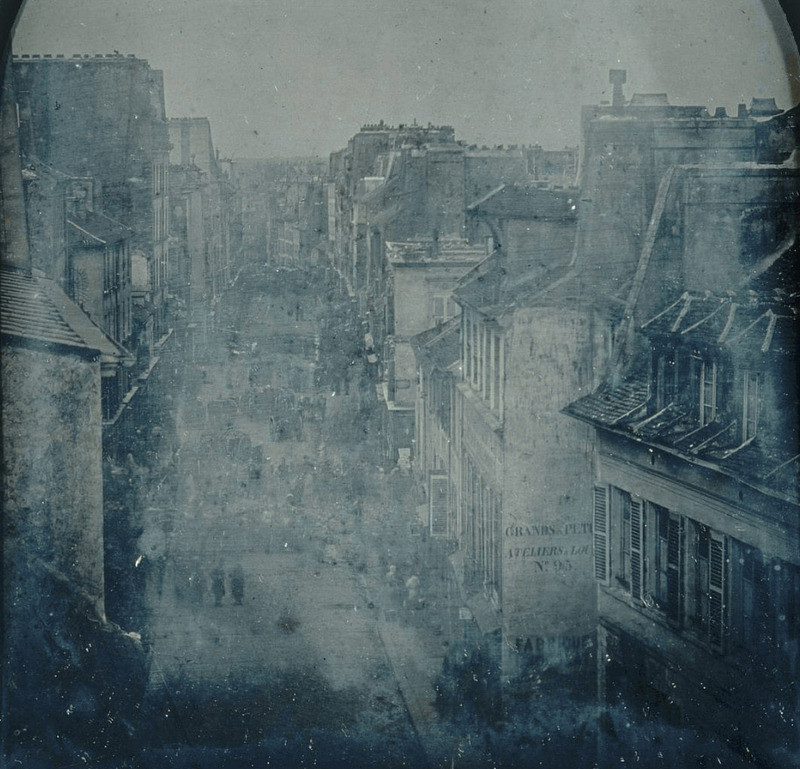 He and his partners didn't start to commercialize it until 1839, and so when Thibault took this image, he was using a technology only nine years old. It'd be as unusual as someone describing the last Apollo landing on a home computer. It wasn't easy to take a Daguerreotype. You need a sheet of silver-plated copper, polished to a mirror finish. The slightest imperfection means the image is marred, so you have to keep it as pristine as possible. You take that sheet, then treat it with chemical fumes. Working quickly, in the dark ─ the fumes make the sheet light-sensitive ─ you shove the sheet into your camera, which is little more than a wooden box with a simple hole in the front. That hole is covered with a simple glass lens, itself concealed by a leather or fabric lens cap. When you judge the time is right, you remove the lens cap and wait. How long you have to wait depends on how bright the scene is. If you're in bright sunlight, you only need a few seconds. If you're working indoors or on a dark day, it might take minutes. You have to keep the camera perfectly still on its tripod ─ any vibrations will blur the image. An 1841 instruction manual indicates, "For an exposure by overcast, dark skies in winter 3 ½ minutes is sufficient; on a sunny day in the shade 1½ to 2 minutes are enough, and in direct sunlight it requires no more than 40-45 seconds. The last, however, is seldom employed on account of the deep shadows necessarily obtained." When you think you've got it (estimating the precise time necessary was by guess and by God until experience allowed the creation of timing charts), you put the lens cap back on. To develop the image you have to ─ again, working in the dark ─ expose the chemically treated sheet to mercury vapor, a substance we now know is incredibly toxic. Once done, the sheet has to be washed by a chemical that removes its light sensitivity. Rinse the sheet, then dry it, taking particular care to avoid rubbing against the sheet. The image is so easily marred that you can scuff it or erase parts of the image even with the lightest wiping. Once the sheet's done, you immediately put it into a glass case to avoid touching it ever again. Imagine Thibault doing all of this from a top-floor apartment at 7:30 a.m. on June 25, 1848. That's exactly when this image was taken. As Thibault crouched over his camera, the soldiers of General Louis Eugène Cavaignac were marching on Paris. Cavaignac had been serving with the French Army in Algeria, where he had a reputation for brutality against the native population. Facing him in Paris were an estimated 170,000 working-class Parisians furious at the government's closure of a series of make-work factories designed to alleviate unemployment. Thibault knew what was coming, and so did the other people on his street. You can see it in the closed shutters up and down the road. Since February, the liberal and radical workers of Paris had been protesting, rioting and simply arguing against the government. All across Europe, in a sweep of events not unlike the Arab Spring, cities were inflamed by liberal and progressive rebellion. Not unlike the Arab Spring, these uprisings were militarily crushed. But Thibault stayed over his camera, an early-Victorian nerd eager to preserve the moment rather than preserve his own safety. In the end, he not only took this picture, he went back 24 hours later to take another. Amazing picture and snippet of history. Not sure if this is on topic but I felt that the fact that there's only one left, is a bit of a historic moment. Not only the oldest, but as far as it is known she's also the only person alive, who was born in the 19th century! Emma Morano (116) was born on 16 november 1899. That's somewhere in between Alfred Hitchcock (18 August 1899) and Humphrey Bogart (25 December 1899), ancient long gone, iconic figures. Looks like she is still healthy! Every morning she eats meat, pudding and raw egg. She thinks she lived long because she was a bachelor for a long time (married once in 1926 but lives alone since 1938) and because of the raw eggs. According to her doctor it is in her genes. Her sisters were also very old. Anyone got a cool recent (post-WWII) example of a country threatening to attack another country over some issue(s)? Doesn't matter which issues, just issues Anyway, finished this one a while ago with 25 out of 25 points anyway 2nd example I used was some border dispute between India and China in the 1960's. We visited the HMS Trincomalee today, probably the oldest British warship still afloat, now restored (about 60% is original), and open as a museum in Hartlepool. It's a frigate, built in the early 1800s. Annoyingly, I spent all afternoon earwormed by Ghost of the Navigator. Night Prowler and Forostar like this. Same vintage as the USS Constitution, which myself and several other forum members visited in 2012. She's beautiful. Ottoman invasion of Iceland, Dutch commander in charge. Never heard of these before. Dutch Imperialism at its most flagrant. Empires, slaves, pirates, I call it early modern fun at sea. Jan Jansoon is one of the inspirations for the novel I've been writing on and off for the last little while, although a lesser inspiration than that of the great Uluj Ali and Turgut Reis. ... (other Dutch pirates) who did not attack/harm the Dutch. It is not known how and when Janszoon came to his end but it is rumoured he had "a quiet old day" (getting old in peace) in the Netherlands.